Classically Liberal: Walking with Ghosts. I've been walking with ghosts today and my feet are sore. Today I'm in the Loop, that section of downtown Chicago ringed by the elevated train that everyone here calls the L.
My paternal grandmother was born and died in Chicago. Every Christmas I would spend some visiting her. And she would take to me to the big Christmas party at Marshall Fields & Co. Fields was THE department store in Chicago and my grandmother worked there her entire life. Sadly, like my grandmother, Fields is no longer alive. It was taken over by Macy's. But the grand Fields building still stands. So this afternoon I spent several hours trekking about the Loop, including a stop at Fields. The grand Tiffany glass ceiling is still there. And much of the spectacular nature of Fields still survives. I rode the elevate up to the 7th floor, to the famous Walnut Room. As I exited the elevator I knew immediately that this was the place where my childhood Christmas parties were held. What particularly pleased me was that the massive Christmas tree was already up and decorated. I fear I was too early for it. Standing there and looking across the room at the tree I remembered being in that room with my grandmother, standing under a similar tree. A wisp of my childhood came back to me. My eyes slightly misted up again thinking about those good times. My grandmother also had another Fields tradition that she kept up her entire life—Frango mints. Every so often, while she was alive, this wrapped parcel would arrive wherever I happened to be. I immediately knew it contained Frango mints, even without unwrapping it. Just outside the Walnut Room is the place the Frango section. I now sit here with four pounds of chocolates, but several boxes are gifts that I will be mailing out shortly. One of the boxes is open and I'm letting one of the mints melt in my mouth as I type. I dread what this will do to my weight this week. A part of my life has come back to me, at least for today. Time, I think, is our enemy. It robs us of our youth, our lusts, our loves, and eventually our lives. It even robs us of one the one thing it gives us—our memories. Memories fade. Standing inside Fields today I also realized how much of the past is gone forever. The people are gone. Even many of the people are gone. And what memories there are, are but faint impressios. They are not memories as much as silhouettes of memories. For but a split second I saw myself, as a boy, with my grandmother standing across the room. There was the tree, there was a Santa Claus dispensing gifts, there was egg nog and food. But there are only faint impressions of all of them. The rest has faded into oblivion. All that is left of my grandmother is the memories that I, and my brothers, hold of her. But those diminish at a steady rate. Her death will be complete with our deaths, as the last memories of her will be gone as well. 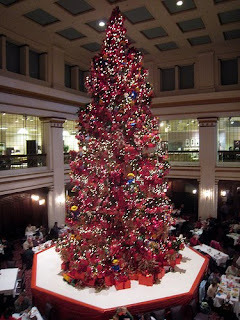 Photo: the 2008 Christmas tree from the Walnut Room. posted by blog owner at 11/06/2009 12:17:00 AM DiggIt! Reddit Del.icio.us Slashdot It!